IDEAL FABRIC DRAWER: 13 inch cube design (33 cm) is just the perfect size for cube organizers. Suitable for most cubicles shelving units, side-tables or Closet Organization Systems, like: Ikea Kallax, Better homes and gardens, Target Threshold, ClosetMaid 1109, Foremost 327806. The storage cubes designed with keen attention to details to satisfy your organizational storage needs SUPREME QUALITY STORAGE BIN: Made with durable 100% polyester fabric that makes spot cleaning easy. Capable of withstanding wear and tear COLLAPSIBLE DESIGN: Folds flat when not in use for easy storage. The storage containers can be folded and unfolded easily to your convenience. 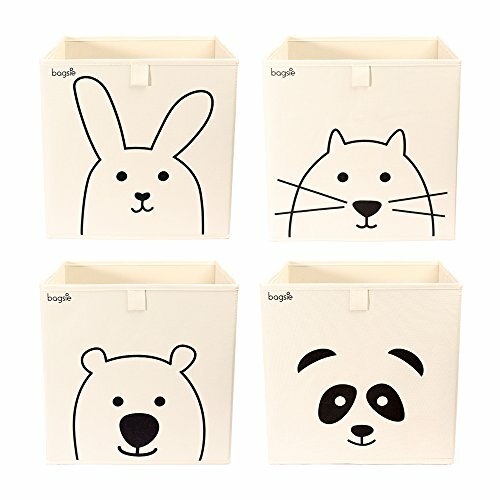 The sides and bottom of the storage bins for kids toys have been reinforced by sturdy inserts that ensure it remains steady for prolonged and hassle free use PERFECT FOR THE NURSERY, BEDROOM OR PLAYROOM: Cute and attractive Nordic style printing make them fun storage for your child. The cream color gives it a clean, simple yet sophisticated look HANDLES FOR EASY AND CONVENIENT ACCESS: Our adorable collapsible storage cubs feature front handles that make it easy to pull from shelf. Side handles for carrying storage bin making the collapsible bin simple and easy to use.